Since being FRUGAL is the new trend, I wanted to share an idea that has worked very well for our family the last couple of years. We have a mason jar that sits in a highly visible spot in our house. 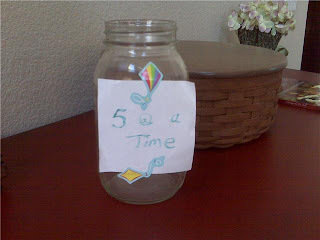 It is our "5 at a Time" jar. And it gets filled up with ONLY 5 dollar bills! Well, as most of us know, we all spend less money if we use hard-to-part-with-cash instead of our slippery debit cards! So, the first tip is to carry cash for your spending. So, simply make a habit of stuffing your 5 dollar bills in the jar and watch it fill! It will be a fun project for your family and you will be AMAZED at how much you can save that way....within a short time, you'll have an extra 300 bucks! Will this work for you? 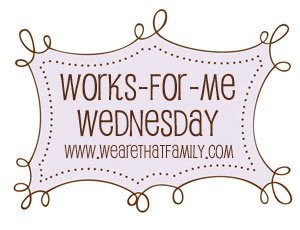 Let me know and check out other Works for me Wednesday ideas here! Great idea. I put loose change in a can each night. Two days ago, my wife hauled it to Coinstar and we got $170. I like this idea! I think I'm going to start a 2 euro coin jar for myself! What a great idea! I think a $5 jar set aside for a special little vacation would be fun too, and good motivation! Ooh, I've never considered doing this with "big" bills like $5! I bet you'd collect money really quickly. What kind of stuff do you do with your haul? What a great idea! I happen to have a $5 in my wallet right now. I'm going to give this a try! We collect coins, but have never considered collecting the big stuff. It would be a great way for saving up for something big. LOL, and here I've just been trying to save quarters! Sounds like a great idea. ha I would save lots of $$ by not spending just to avoid having to put precious fivers in :) Good for you! Our budget is rather tight right now..I suppose I could do a $1 jar though, eh? The cool thing about $5's is it causes us to "feel" the savings a little more than if we saved coins or $1's. It's easy to save the "extra" but taking it just one step further and having to sacrifice a little causes the savings to grow exponentially. Thanks BlueEyes! This is a great idea! I don't think I could afford to do it with $5's, but I sure bet it adds up quickly! This is a great idea! I am going to have to talk to my husband about trying it! Do you have specific things you use the money for? Sweet Pink and Bad Black: 50th Birthday!